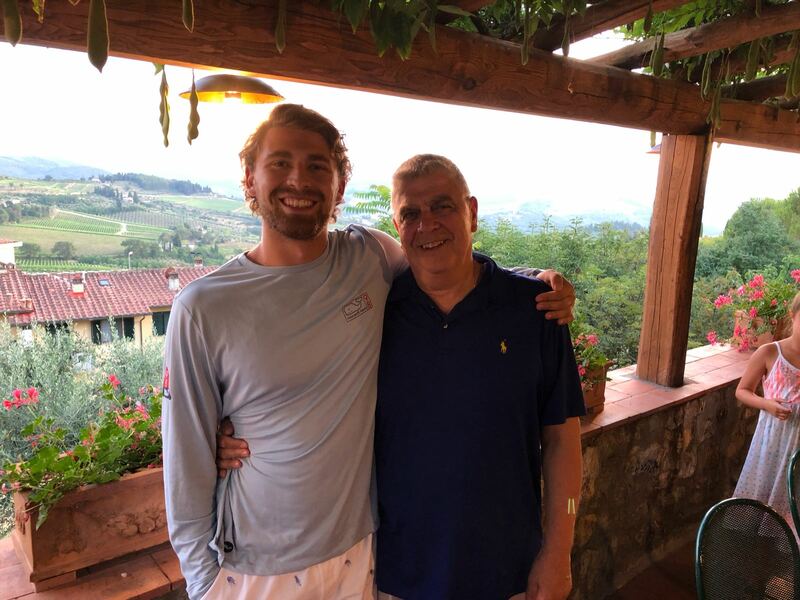 Welcome to my third installment of My Trip to Italy: Tuscany! 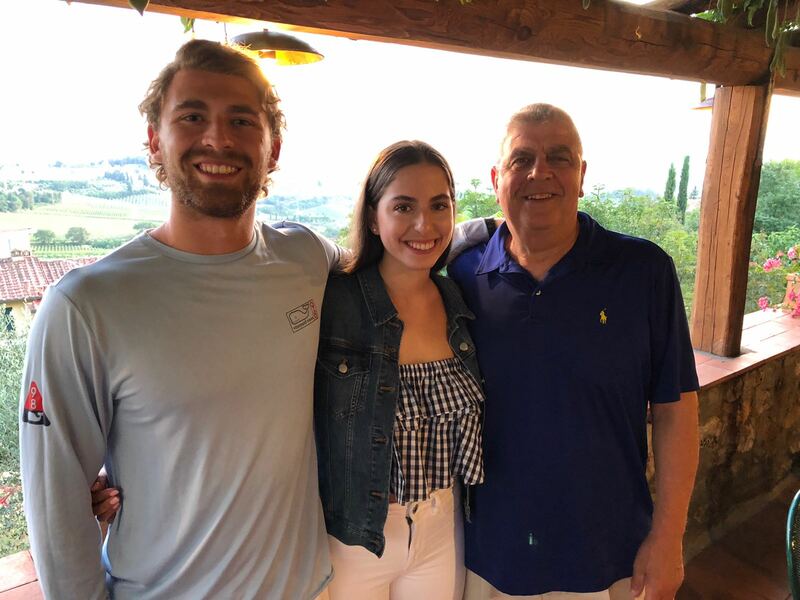 Click HERE to read about my time in Rome and click HERE to read about my time in Florence! After our minor car accident, we made it to Panzano, in Chianti in Tuscany, a very cute village about 45 minutes from Florence. Finding our villa was very hard. The directions and address that our travel agent gave us were incorrect and did not take us to the right spot. But after making it to town, we found a hotel and the lady at the front desk was able to call the manager of the villa and he was able to come save us, after a super nauseating ride with windy roads. I would not recommend driving in Tuscany at night unless you know where you are going. 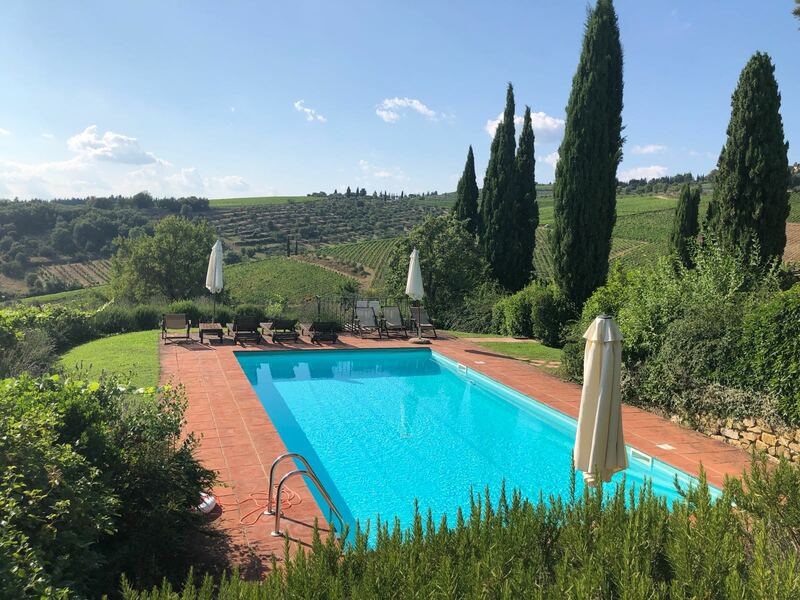 There was a bit of stress and aggravation with getting lost and not having data, but once we got to the villa and saw the views, and the great pool, we were calm and ready to begin relaxing after all of our touring! Our villa is called La Rota. There were 3 houses, one for each of the families on our trip- one for my sister and her family, one for my brother and his family and one for my parents with my brother and I! The villa was pretty rustic; there was no air conditioning, plenty of mosquitos and a washing machine but no dryer, but it had amazing views! I kind of felt like we were in the middle of nowhere. We were surrounded by olive trees, and grape vines but we are only a mile from town! The first night in Tuscany, we went to dinner at Cantinetta Sassolini in Panzano. It was the oldest building in Panzano that was turned into a restaurant. I had gnocchi for dinner, which was served outside and I enjoyed my meal while I got eaten alive by mosquitos. It took us 10 minutes to get to the restaurant, but it took us 45 minutes to get home because we got seriously lost. Data is a necessity because Google Maps is a necessity in Tuscany! Waze, does not work well, at all. We ended up on a dirt road, the car was all banged up, so good thing my parents took out full coverage insurance on the car! Another pro-travel tip right there! We also learned that if you end up on a dirt road TURN AROUND!! My first morning in Tuscany consisted of my sister and sister-in-law dragging me out for a morning run into town. Only one and a half miles, but completely uphill! The road to our villa is so steep, I couldn’t run it. I could barely run the rest of the route into town. I could feel the elevation of being in the mountains and it was not helping my poor attitude towards running. But, I did run the whole mile and a half home because it was all downhill!!! 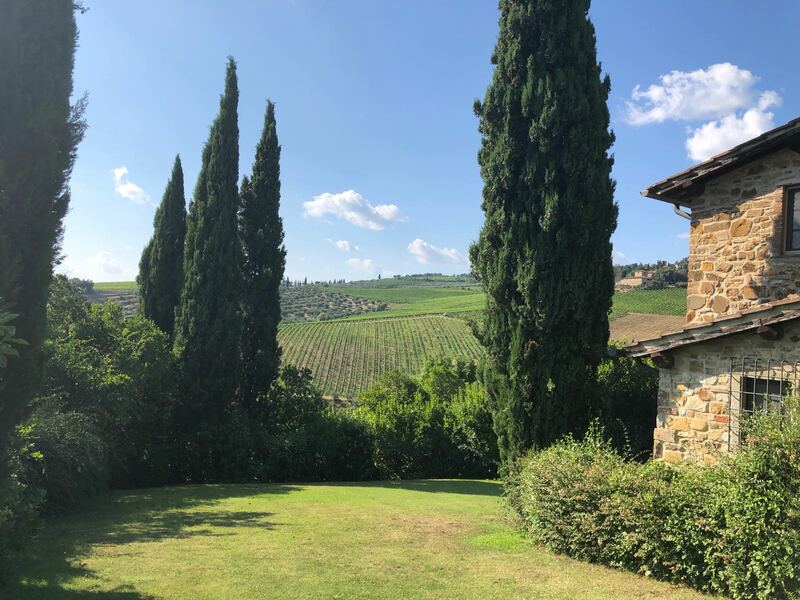 After our exhausting run in the heat and mountains, we changed and got ready for a private vineyard tour, lunch and wine tasting at Il Palagio di Panzano vineyard. I wore my J Crew navy blue eyelet dress with my big J Crew floppy hat (similar) and my Jack Rogers. The sommelier, Irene, was so knowledgeable and so cute! She put up with all of my family’s crazy nonsense. 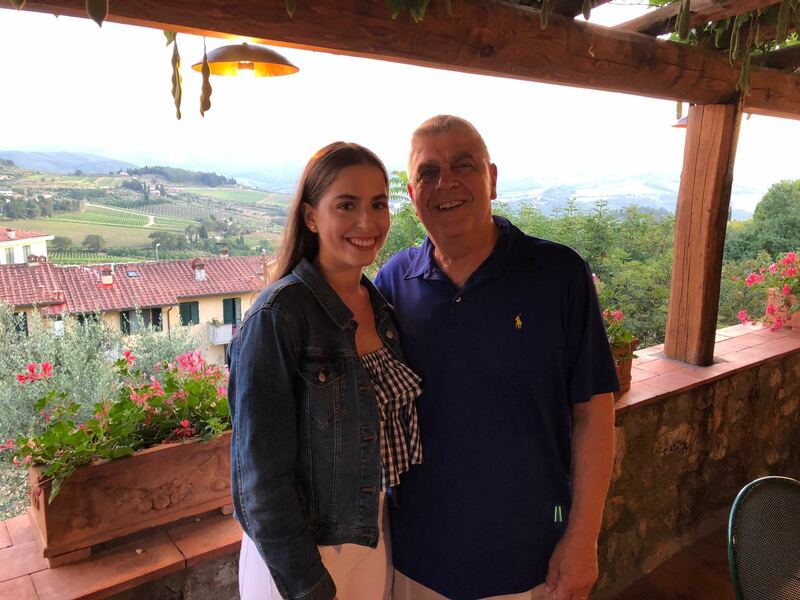 After learning about how the vineyard makes the wine, and we got a tour of the Chianti Classico vineyard, we sat down at this table fit for the kings and queens of New York, aka our family and had a feast! With every course, we had a different glass of wine and learned how to properly smell and taste the wine. I learned that when opening the bottle, don’t touch the cork with your hands for fear of contamination, rather, sniff the cork while it is still in the bottle opener. After the bottle is open, pour the wine into the glass and hold the glass by the stem, so your perfume doesn’t contaminate the smell or the taste of the wine. Then, you can tilt the glass and see what color the wine is when you hold it up to the light. If there is sediment in the wine when you tilt it, that means it is a good wine! We must have tried about seven wines! It was such an amazing meal with such amazing people! After our three-hour lunch, we hung out at the pool and realized that we were too stuffed (and drunk) to eat another large meal. We figured that it was best to stay home for dinner and bring in some food! Pasta, pizza and salad were acquired, and we were able to have a nice relaxing evening at home, including card playing. Going out to dinner night after night is exhausting, so it was really nice to hang out at the villa. After a day of relaxing we were ready for some more exploring! We went to San Gimignano, an ancient walled-in city about an hour from Panzano! More windy, nauseating roads but the roads weren’t too bad in the daylight. The city was really cool and we got to do some shopping! I wore my J Crew Factory white eyelet blouse with my J Crew factory cotton wrap skirt (ON SALE) and my J Crew factory "New York" white and pink bandana in my hair. As you know, Italy is known for their leather, so my mom treated me to a really cute navy leather top handle purse to remember my time in Italy. I am obsessed with my new bag! It is so lady-like and I will always remember my time in Italy when I look at my bag! I also got a little leather keychain that I might put on my keys or on my new bag! I am so excited to use my new purse! I was really looking for a scarf as a souvenir, because it all started in Paris when we bought scarves as our mementos, and I wanted to keep that trend going but I didn’t really see any that I liked and after all, Italy is known for their leather!! After shopping we ate lunch at this really good restaurant, La Mandragola, and of course finished the meal with gelato! 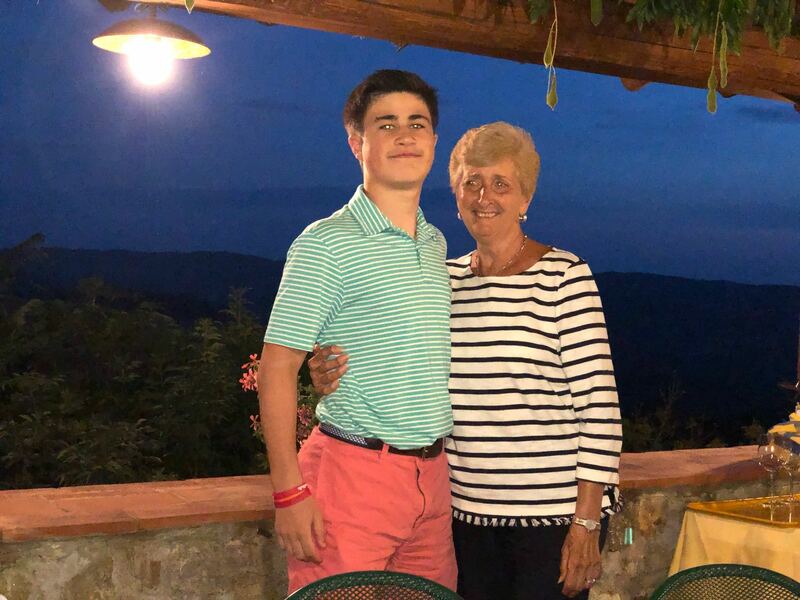 We then hung at the pool before going to dinner in Panzano at Ristorante Oltre il Giardino. This restaurant was sooo good and the views were breathtaking! I had wild boar stew for dinner with some risotto on the side. 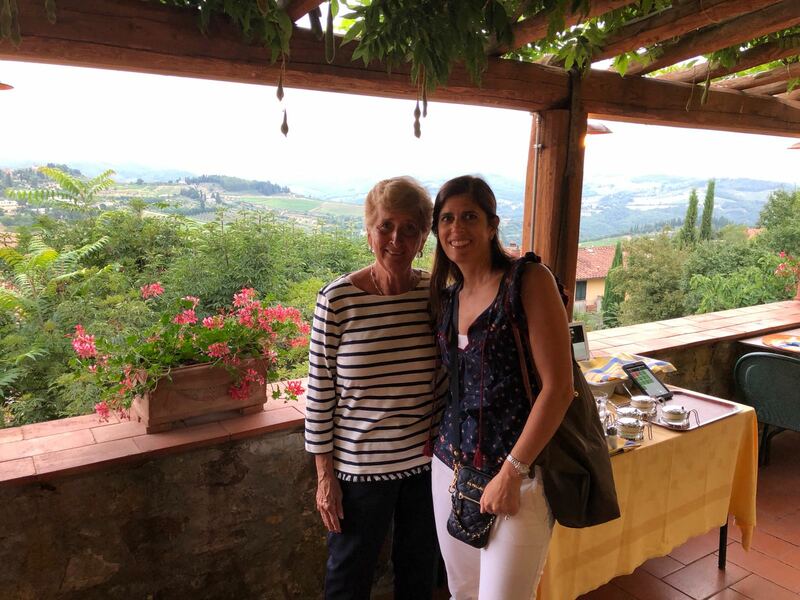 You could see grapevines for miles and miles and miles over the hills in Tuscany from this restaurant! The ceiling of the restaurant was even covered in grapevines! After dinner followed gelato in the little town square. I had gelato just about every day, and by the end of the trip my pants were really tight, but I had concluded what my favorite flavors were: raspberry, mixed berry and chocolate! On the 27th, we walked to town for a little cardio, because we were starting to realize that our pants were very tight! We had lunch at the pool at home and decided to go to another little city for dinner. 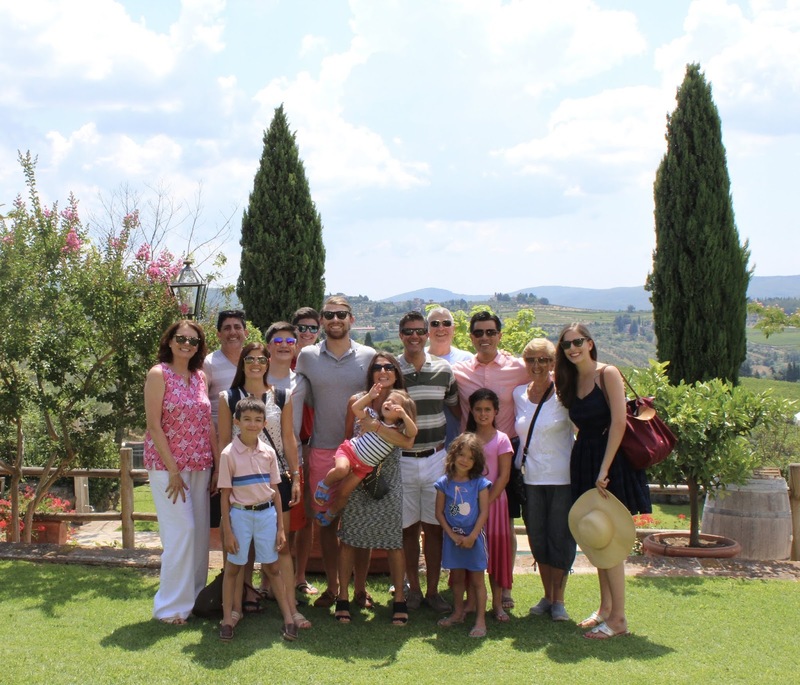 We went to Castellina and ate at Taverna Squarcialupi for dinner. It was my least favorite meal of the trip, but it was still amazing. Instead of bread, our waitress brought out deep fried pizza dough, which was probably the best part of the meal. I had pasta for dinner (shocker) and then some more gelato for desert (shocker.) The gelato was less than satisfactory, in my opinion. I did choose the Nutella flavor, which was a bit of a risk, and I regret the risk. Apparently, Castellina is supposed to have the best gelato in the region, but I didn’t think so. 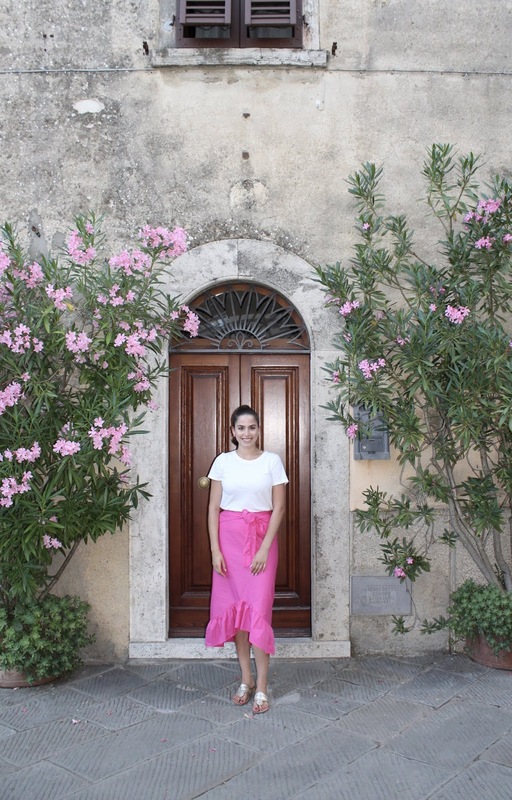 I wore my J Crew Mercantile t-shirt, my new favorite t-shirt, with my ASOS cotton bubble-gum-pink mermaid skirt (ON SALE)! High pony tail and Jack Rogers were my accessories! After getting gelato, my brother-in-law ran to tell me that there was a French family sitting outside of the gelato shop, on a bench and that they wanted to meet me after hearing from my brother-in-law, that I am going to France in the fall. I hardly understood the family as they were speaking very quickly, but I tried my hardest and got some words across coherently (I hope). The roads were very windy and nauseating on the way home, and a bit treacherous in the dark. But we did not get lost, thankfully! Our last day in Tuscany, July 28th, was a bitter sweet day. We were sad to leave but a bit happy to be going back to air conditioning and mosquito free conditions in the states. I slept in for the first time of the whole trip and treated myself to sitting at the pool and reading my book. I also played in the pool with my nieces and nephews! I used to love swimming and playing in the pool when I was little, and I forgot how much I loved it! It was so fun to be back in the pool. I felt like a little kid again. I skipped lunch because I wasn’t hungry after all the food I had eaten on the trip, but don’t worry dinner made me stuffed! We hired Chef Mimo for our last dinner. He came and cooked us dinner at our villa. We sat outside under the stars, got eaten by mosquitos and ate our last meal in Italy all together! 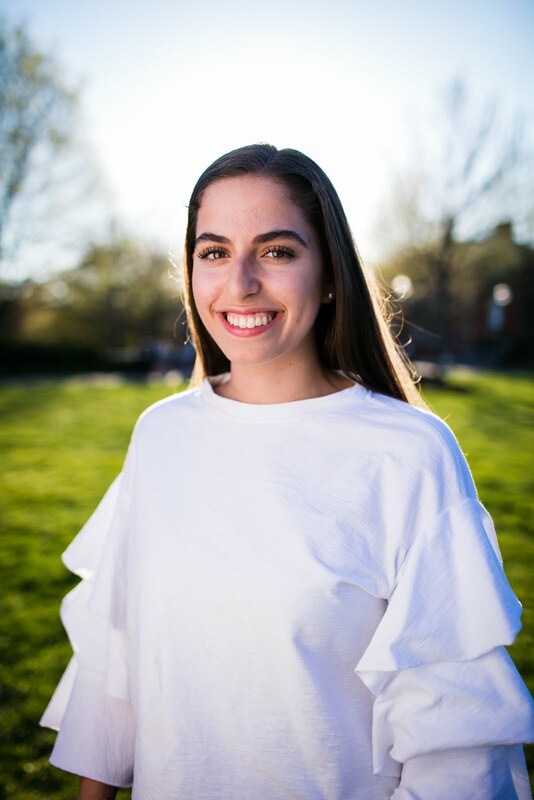 I wore my J Crew Factory navy blue bow tank top with my American Eagle white high waisted skinny jeans (held in my food baby), J Crew Factory gold hoop earrings and Jack Rogers Hampton sandals in platinum. We had an absolutely AMAZING trip! We had more laughs then I can count, we drank more wine than we should have consumed, and definitely ate more pasta and gelato (I think I had 9 in total) than we should have. It was a once in a lifetime trip and we now have stories to last a lifetime!